(1) Drive speed: 14KM/H. (2) Gradeability: 22%. 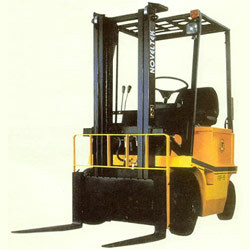 (2)Electric sit-on type forklift truck has much smaller turning radius than Diesel forklift truck, it is very good for in-door and out-door use. (3)It has no noise & no pollution. (4)It use baked enamel coating and free lift 280mm as standard. (5)Micro processed charger with equalizing function is standard equipment. (6)Soft solid tyres can be used 5 years without any service. (7)Full hydraulic power steering, with a very small turning radius. (8)Electricity fuel cost is much cheaper than Diesel by 67% less. (9)-35°C cold storage version, special attachment clamps are available.